My husband and I agree on a lot of things. We both think a drive in the country is a great way to spend a lazy Sunday afternoon. We get sucked into PBS shows on random topics. We hardly ever argue about how to raise our son. And we both love cookies. About all these things we agree. However. (You knew there was a however, right?) We disagree about these cookies. I like them. A lot. They’re not overly sweet. They’re not very assertively flavored. They’re not very pretty. They’re comfortable and homey. I think they fit right in with the theme of Slightly Indulgent Tuesdays from Simply Sugar & Gluten Free. My husband, on the other hand, thinks they are boring and not sweet enough. I guess you’ll just have to decide. What say you? Good, bad or indifferent? Combine all ingredients except bananas and chocolate chips in the bowl of a food processor and let rest for 30 minutes. Preheat oven to 300 degrees. Add bananas to food processor and pulse until a dough forms. Stir in the chocolate chips. (I found it’s easier to do this if I dump the dough into a bowl first. The dough will be somewhat wet, depending on how ripe your bananas are. Use a cookie scoop or rounded tablespoon to drop dough onto greased baking sheet. (I use parchment.) These cookies don’t really spread, so they can be somewhat close together. Bake for approximately 15 minutes. Over baking these leads to tough cookies, so be careful. 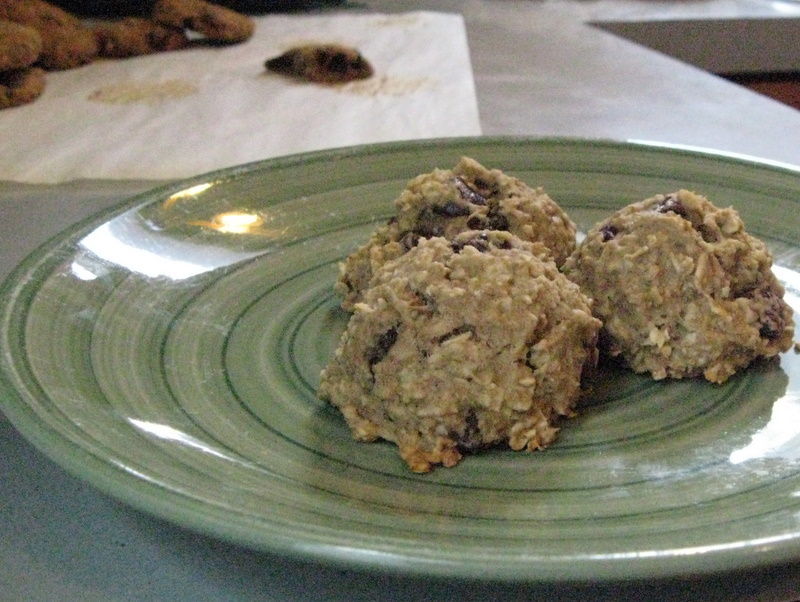 These cookies were inspired by the “Oatmeal Bowl to Go” cookies from Enjoy Life’s Cookies for Everyone – a book I highly recommend. This entry was posted in bananas, chocolate, cookies, oatmeal. Bookmark the permalink.